Published Friday, December 28, 2012, OK personal/derivative use; link www.lovethatimage.com. 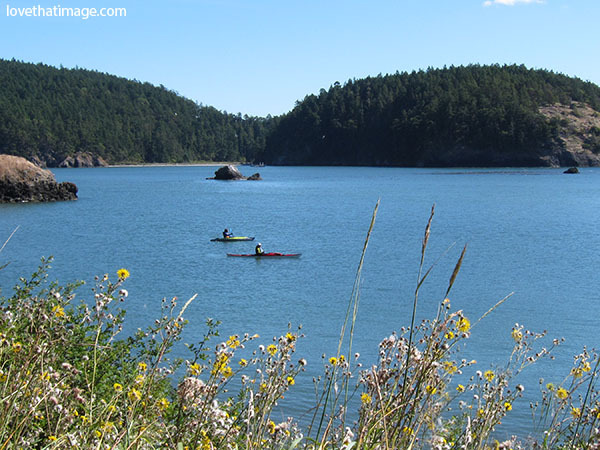 As this year comes to a close, this photo of two kayakers on Bowman Bay, right off of Deception Pass in western Washington State, really “floats my boat.” It symbolizes the feeling I have of moving out into life, alone but with a companion, on water which is dangerous but gives so much pleasure. The blue sky and water, the calm day, the companionable silence, and the feeling of freedom, make this a picture of my wishes for you in 2013. May you have these blessings and more. In the ancient system of I Ching, water is the symbol in two of the eight basic parts of the hexagram. One is the symbol for Danger, and one is the symbol for Lake, or Pleasure. I love that. Participating this week at Skywatch Friday, A Piece of Heaven, Outdoor Wednesday, Scenic Sunday, Water World Wednesday, Nature’s Footsteps Waters, Ruby Tuesday 2, and Mellow Yellow Monday. Thanks for visiting, and come back soon! If there’s only the one photo here, please click on Sara’s Fave Photos Blog above for the rest of the pretty pictures. Thanks! wishing you and your family a healthy and wonderful New Year! How peaceful. Happy New Year! That is a lovely place to be… great shot. Beautiful capture, love your thoughts about it!